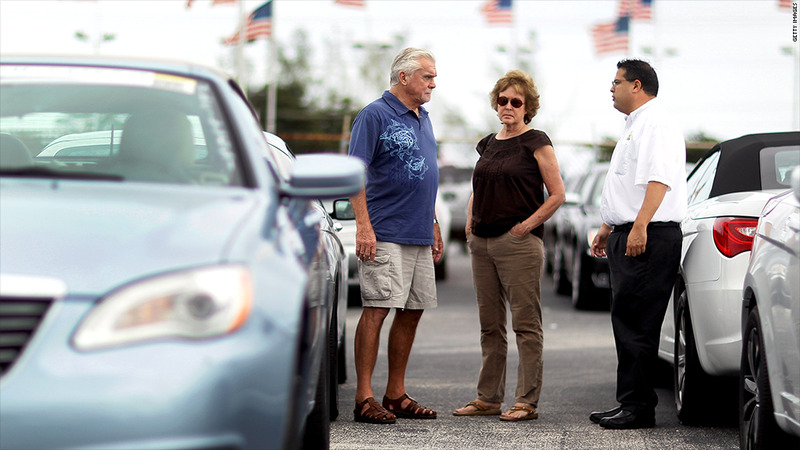 Consumers are shedding credit card debt, but adding more car loans. Americans continued to shy away from credit cards in the second quarter, but kept taking out auto loans. Credit card balances declined to $672 billion, down 22.4% from their peak at the end of 2008, according to the Federal Reserve Bank of New York's quarterly debt report issued Wednesday. At 10.9%, credit card delinquencies are at their lowest level since the end of 2008. And credit inquiries, an indicator of demand, fell for the second consecutive quarter. Auto loans, on the other hand, rose $13 billion in the quarter to $750 billion as credit availability increased and consumers looked to buy new vehicles. Total new car sales were up 16.3% in the second quarter, compared to a year earlier, according to sales tracker Autodata. Originations were up 14.2% in the quarter to $82 billion. Overall, consumers continued to shed debt, the report found. Household indebtedness declined to $11.38 trillion, a $53 billion decline from the first quarter and a $1.3 trillion drop since its peak in the third quarter of 2008. The drop was driven by declines in mortgages and home equity lines of credit. "As they continue to pay down debt and take advantage of low interest rates, Americans are moving forward with rebalancing their household finances," said Wilbert van Der Klaauw, economist at the New York Fed. Mortgage balances continued to fall, dropping 0.5% to $8.15 trillion. Home equity lines of credit balances fell by 3.7%, or $23 billion. Mortgage originations rose to $463 billion. Just over 250,000 borrowers had a new foreclosure notation added to their credit reports, the lowest number seen since mid-2007. Overall delinquencies improved, with 9.0% of outstanding debt being late, compared with 9.3% in the prior quarter. Student loan debt, bucked the overall trend, rising $10 billion to $914 billion. This sector has increased $303 billion since the third quarter of 2008, concerning economists and policy makers. Delinquencies rose for the second straight quarter and now stand at 8.9%.